The agenda is set for our meeting on Thursday, May 18, and we hope you will join us. Details are below. To review the complete agenda online, click on this link. Serenity Gardens Proposal: A representative of R.M. Towill Corporation is scheduled to outline plans to develop a cemetery on 5.3 acres of land between Puohala and Waiawi Streets near the Kaneohe Stream. Keith Kurahashi, principal planner at R.M. Towill, told our agenda planning meeting that the land is currently overgrown with brush and is appropriately zoned for a cemetery. He said that the project requires City Council approval and that Neighborhood Board support would be helpful. Hawaiian Memorial Park Proposal: Representatives of the mortuary are scheduled to discuss a proposal to expand its cemetery, which is nearly full. 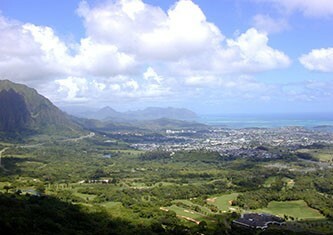 The proposal will require an amendment to the Koolaupoko Sustainable Communities Plan. In addition to adding cemetery space, the project will include a buffer zone to separate the addition from the adjacent Pohai Nani retirement community. It also will include protection for a 15-acre cultural preserve that includes a nearly thousand-year-old sacred site, the Kawa’ewa’e Heiau. Haiku Stairs: A representative of Friends of Haiku Stairs is expected to present a plan for reopening the stairs to the public under managed access. At our agenda planning meeting, we learned that the Friends group believes funds from access fees would cover expenses such as maintenance, security, insurance and staffing. As outlined, this approach would provide educational and cultural opportunities in addition to recreation. Board Vice Chairman Bill Sager is scheduled to present a resolution about the issue for Board action. Note: The Board of Water Supply, which controls the stairs, is seeking public comment as part of a review of the potential environmental impacts of removing the structure. More information about this issue is available on the Water Supply website. Comments on the issue may be sent to haikustairs@g70.design. Comments are due by May 23. Other Business: Our agenda always includes time for reports from the Fire and Police Departments, Marine Corps Base Hawaii, elected officials from the state and local levels, community organizations, and our Board committees. Details: The Board meeting will take place in the cafeteria of Benjamin Parker Elementary School, 45-259 Waikalua Road, starting at 7 p.m. Click on the highlighted link above to read the full agenda and find more information about agenda topics. The minutes of our April meeting and of the May agenda planning meeting also are now available. Click on the highlighted links to read them. Please join us for all of our meetings. The agenda always includes time for comments by community members. If you are unable to attend, you may provide testimony online and contact Neighborhood Board members directly.